Below are the proposals for Superblock 604800. This is the first time proposals are being submitted to the forum individually as replies to this post so please take your time to look over each proposal. The voting for these proposals will end on block 601920, but your node must remain active until block 604800 for your vote to count. 1) Submit a pre-proposal to the Superblock 604800 Pre-Proposal thread. NOTE: I will be visiting family in India up until October 20th. I'll still be working remotely, just from a different timezone. I probably won't be working as many hours and the BLOCK below reflects that. * Maintain the social media profile of Blocknet on Facebook, Twitter, Reddit, BTCTalk, Youtube, Medium, and other platforms. * Compile and write regular newsletter, write and contribute to articles on all platforms and continue to contribute to various marketing materials and initiatives. * 3 articles are ready for publishing when the DX is 100% ready and in addition a separate 3 part article on DXs will be undertaken in collaboration with others. Work has begun for some of these items. Progress was slowed due to focus put on other items such as Block DX and helping out with testing. This proposal is to have a single tier block reward system. This means that out of every block reward, instead of having 70% (0.7 BLOCK) going to Service Nodes and 30% (0.3 BLOCK) going stakers, both Service Nodes and stakers would be combined into the same pool for 100% of the block reward. The Service Node list for block rewards is too fragile to maintain and causes forks in the network due to the structure of the block reward payouts. The single tier block reward system remove need for this list in this context and the issues associated with it. The current difference in staking and Service Node rewards incentivizes Service Node operators to switch to staking, which causes fluctuations in Service Node support. This change increases the amount of stakers on the network, therefore increasing the security of the blockchain. The ROI of stakers and Service Nodes should be barely affected over time as the constant rebalancing of BLOCK from Service Nodes to staking naturally brings the ROI of the Service Nodes and stakers to an equilibrium. 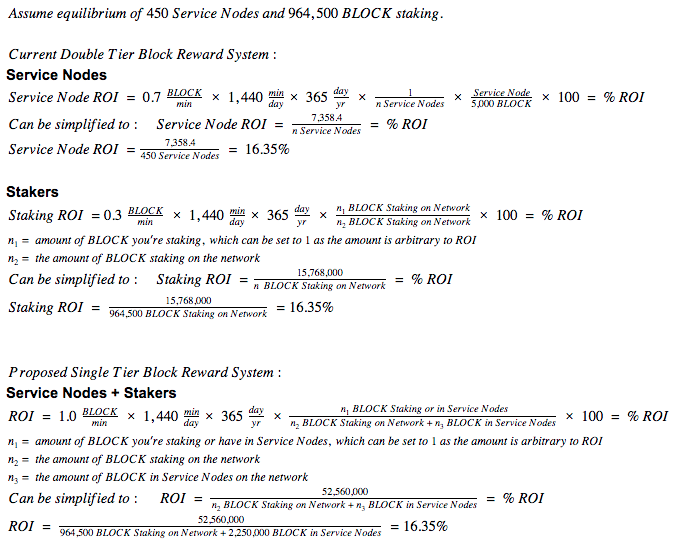 The ROI of an equilibrium state in the double tier block reward system we have now is equal to the ROI of the single tier block reward system as can be seen below (below). Everyone can stake, even Service Nodes. The total block reward will continue to be 1 BLOCK. There will only be one block reward winner, either a typical staker or a Service Node, and they receive the entire 1 BLOCK reward. Winning a block reward will remain probabilistic based off the amount you're staking vs the amount staked on the network. A 5k BLOCK input will still be required to run a Service Node. A 5k input will still be required to vote. Proposal: Art Director for @808 / Bob. Please see http s: // goo.gl/ kdhgb2 for the full proposal (*manually remove spaces in the URL). 1. Continue working on the media/template library. 2. Creating marketing material for Block DX marketing campaign. 3. Providing community, the team & brand-leads with media content. Templates and the media library are going to allow the social media teams to put together quick designs. It helps maintain the level of quality required and reduces cost and time to produce content. As we continue to strike a balance in decentralization and pragmatism it is important to have a channel where partnerships, prioritization and performance can be discussed. The Strategy channel offers this. Some paid members are using the channel more than others and I still hear about strategic discussions going on in paid-members channels only. This is perhaps due to the convenience that many closed channels are the same people as the strategy channel, so discussions just follow the natural flow. I propose to expand the strategy channel to make it more diverse. Bringing in some of our investor members that are very experienced in running businesses. While everyone can make a proposal to join the strategy group, my nominations for this role will be conservative for now. Handpicking nominations and seeing how the chemistry is with the rest of the team. Some people feel that there is becoming a divide between those paid and those contributing for free. I hope the strategy channel can help with this, also as work on the governance model picks up again. I nominate Redactedman to join as a strategy group member. To help with business acumen and to challenge in a constructive way the paid members and founders to ensure the investors interest. I will be continuing to review the development of the XRouter SPV implementation. The goal is to merge XRouter dev into the main codebase so that developers can begin using the XRouter system with the latest wallet updates. I am continuing to improve the build and CI processes of the team on the Gitlab platform. Goals this month include unit test integration into our build system.